You’ve got a class? Britannica’s got your Pack. 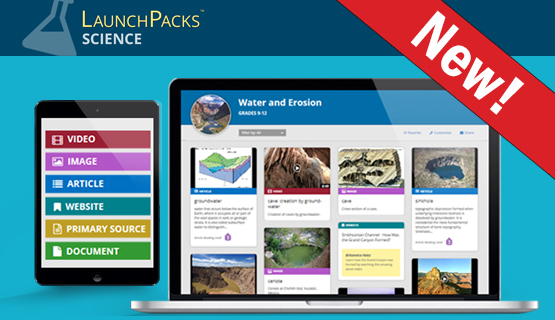 Britannica Digital Learning’s favorite teacher resource, LaunchPacks, has just released a new solution for science classrooms. Easily differentiate Pre-K-12 science instruction and find diverse, up-to-date, curriculum-aligned supplemental resources with Britannica’s newest classroom resource, LaunchPacks: Science. Teachers can save hours of planning time each night, meet literacy standards with science content, enhance labs with images and videos, and build active engagement with text through annotation tools. ✓ Content is aligned with district curricula and NGSS skills and assessments. ✓ Articles are available at three different levels, so teachers can easily differentiate reading instruction for students. ✓ Teachers can choose what works best for their students and curriculum focus. They can customize Packs by adding or removing content, appending notes, or uploading their own content to share with others. ✓ LaunchPacks: Science builds connections between science disciplines through one tool that allows searching across all science concepts. ✓ Content Packs are designed with interrelated elements—articles, images, videos, documents—to provide a rich context and the full story of events, rounding out content area understanding. ✓ Material is highly reliable, up to date, age appropriate, and prepared by Britannica editors. These age-appropriate packages are engaging incentives that should inspire individual investigation and inquiry, an expectation found in information skills and Common Core content literacy standards. The user friendly, intuitive interface includes a standard keyword function, with opportunities to narrow searches by grade, category, or browsable visuals. LaunchPacks has already received several district-wide adoptions around the country. More information is available at BritannicaLearn.com and at 1-800-621-3900. Britannica Digital Learning (BDL) provides reliable, high-quality solutions to strengthen student achievement and educators’ ability to teach to best practice. BDL experts produce curriculum-aligned resources for all ages from elementary school to college that make creative and purposeful use of technologies widely used in schools today. Products include: LaunchPacks: Social Studies, Original Sources, Britannica School, Britannica Academic, Pathways: Science, ImageQuest, and Britannica E-books. BDL is a division of Encyclopædia Britannica, Inc., with headquarters in Chicago.